Shirin Ebadi represents a set of values shared by a great majority of Iranians. She is liberal. She is secular. She is moderate. She is moral. She understands and respects human dignity. These are all the things you and I and almost every Iranian deeply believe in. Some ask how can such a decent and courageous person survive this long within the Islamic Republic? I don't know. But one image came to my mind and that is of a chadori woman and her little girl dressed like a Barbie doll. Walk inside a park in any city in Iran and you will see very religious-looking families with young children dressed-up in cute Western clothes. And you wonder, is this what they really want to look like, but can't, for religious reasons? Shirin Ebadi represents all that is good in us. Intellectually, we belong to the same age, that is, our version of the Age of Reason. But there's a thick layer of religious dogma we still have too shed. Old useless skin will peel off, easily. I was just listening to Rumsfeld testifying about the abuse of prisoners in Iraq. He mentioned that there are currently about 11,000 people in U.S. detention on Iraqi soil. Then he noted that the number is actually lower, because 3,800 of them are MEK members, who are not really under criminal detention. For the longest time people have been guessing the size of Mojahedin Khalgh forces in Iraq. Now we know. It's more than I had imagined. I wonder what's going through their mind these days; Iranians in limbo in Iraq, men and women thirsty for molla blood and only one very very very determined mission in life.. In total, Iranians gamble $194 million per year in legal gambling establishments (the win-loss ratio not available). Looks like Khamenei is not just unpopular; people could care less about him or his opinion or his decrees. 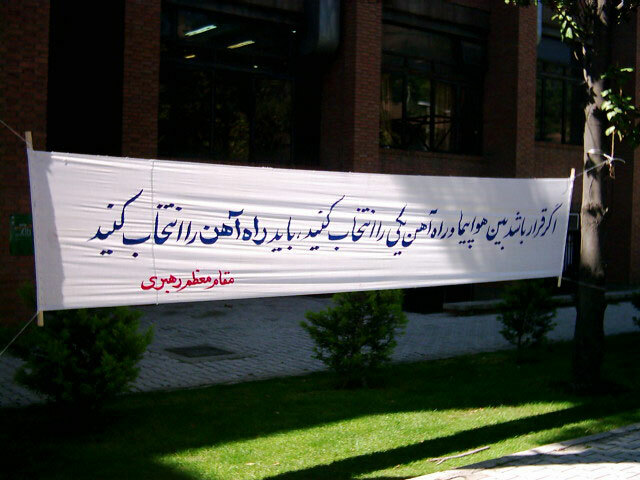 Banner from a cultural center in Tehran reads: "Based on the Great Leader's fawa, it is not permissible for women to ride a bike in public." There's no question in my mind that Kiumars Saberi, who passed Friday, was a great satirist. He was for many years, one of my heroes. He made light of the government and its policies during the middle of a devastating war with Iraq in the 1980s, when authorities were far less tolerant of criticism than they are today. I met Saberi on two or three occasions at Gol Agha magazine's head office, on Tehran's Apadana Blvd, if I'm not mistaken. The office seemed relatively small for a magazine that for many years boasted the largest circulation in the country. The cartoonists and writers were busy working behind desks. From the look on their faces you could tell they were bursting with jokes, but they shared the really juicy ones only among themselves. They couldn't publish those. Saberi was a short man, down to earth, gentle and always smiling. 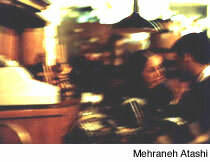 His thick Rashti accent was very sweet, to use the Persian expression. He hired me and a colleague of mine at IRNA's English section to translate his book "Safarnaameh-ye Shoravi", about his travels to the Soviet Union as a member of an official cultural delegation from the Islamic Republic. I thought the book would have some of his famous sense of humor, but it was too dry, I thought, and I lost interest. I told him I could not finish the translation, and I gave the excuse that I didn't have time. Gol Agha magazine and especially Saberi's own daily column -- "Do Kalameh Harf-e Hesaab" (Couple of Reasonable Words/Common Sense" -- were brilliant for their time, especially in the 1980s. The popularity of his daily column in Ettela'at newspaper -- I couldn't wait to get my hands on it, I was a huge fan -- and his weekly magazine indicated that his humor was in tune with a large segment of society. In his ridicule of public officials and their policies, Saberi often sided with the moderate/reformist camp. He directed his sharpest attacks against the rich, religious extremists and the corrupt post-revolution bureaucracy. But he knew his limitations. He and his cartoonists were not allowed to criticize the clergy and sketches in Gol Agha could not lampoon anyone with a beard; i.e. government officials [See cartoons]. It was rather odd, for instance, seeing cartoons of clean shaven men representing members of parliament, where in reality, nearly all MPs are bearded. I remember Saberi saying that he was often threatened with censorship -- by lower rank officials, judges or revolutionary guards -- and he would seek direct intervention from the office of the Supreme Leader, Khamenei, in order to ensure Gol Agha would hit the news stands every week. In fact Saberi and Khamenei were close friends, and for a while Saberi was the director for cultural affairs at Khamenei's office. Khamenei is known as an arch conservative, and to a large extent, that is a true. But especially during the early part of his leadership, Khamenei has been soft on loyal, as well as apolitical, artists and writers. He has a circle of friends and associates who are modern and liberal in every aspect except politics. They understand liberal/democratic politics very well, and they may even believe it to be a better system of government, but they have no desire to interfere in politics. Saberi's satire touched a lot of raw nerves. But he had no intention of challenging the system or its key figures. Over the years Gol Agha's subtle and non-confrontational style went out of fashion. The younger generation preferred critics with sharper teeth and harder bite, notably Ebrahim Nabavi. Nabavi briefly worked for Gol Agha, if I'm not mistaken. But he was too much of a loose canon, in Saberi's view. And he was right. Nabavi is a totally different animal. He shows little mercy; he wants to challenge everything, and has always pushed the boundaries much farther than anyone thought possible. 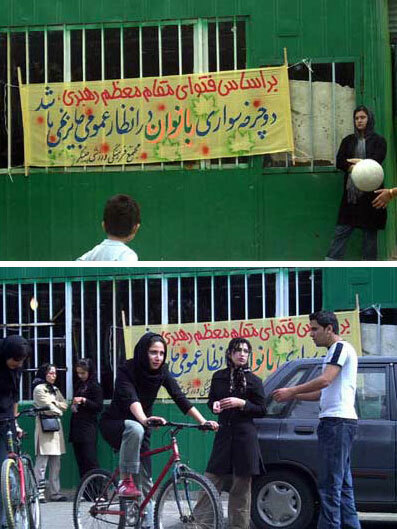 On my last trip to Iran in 1995, I was invited to a football match at Azadi stadium. There were four or five of us in one car, all journalists of one kind or another, including Nabavi. On our way to the stadium, Nabavi acted out the role of a provincial policeman who was on a radio show describing how he had been abused as a child. He was funny as hell. On that same car ride, Nabavi insisted that he had every intention to question everything and everybody, especially the religious establishment. "You'll see," I remember him saying, "You'll see what I'll do to these bastards." I could sense the determination and seriousness in his voice. But it was hard to believe him. No one had gone where he wanted to go. It almost sounded like suicide. Now we know he wasn't kidding. I didn't want to start with Saberi and end with Nabavi. It just happened this way. And now I need to get some sleep!